The Identification of Thresholds for Induction and Elicitation of Allergic Contact Dermatitis. Many chemicals are known to cause allergic contact dermatitis. Validated methods are available for the identification of skin sensitising chemicals, although accurate risk assessment remains an issue. There is an important need for more detailed understanding of thresholds and dose-response relationships for both the induction and elicitation phases of contact allergy. Moreover, there is a need for an appreciation of the association (if any) between these thresholds. Yet another area of uncertainty is the relationship between thresholds and the frequency of exposure. A difficulty in addressing these issues is the lack of suitable methods for measuring elicitation thresholds. The development of algorithms, based on an understanding of dose-response relationships, that would permit derivation of thresholds for induction and elicitation of skin sensitisation. Approaches providing an understanding of the correlation (if any) between induction and elicitation thresholds would be welcome. The name and affiliation of the Principal Investigator of the laboratoryor laboratories in which the research will be conducted. Evidence of the Principal Investigator's expertise, and contributions to the areas of science relevant to this proposal. A clear definition of the research objectives (including a description of the mechanistic basis for any proposed research). An outline of investigation including milestones and critical decision points during the course of the proposed project. An indication of likely costs. 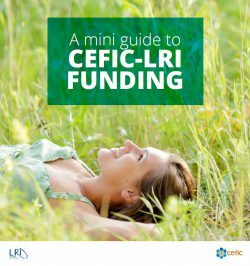 All applications for CEFIC-LRI grants will be dealt with via a two-tiered selection process. Interested parties are invited to submit an initial expression of interest for preliminary evaluation by an ECETOC Selection Team. A form is available on the CEFIC-LRI web-site. Short-listed candidates will subsequently be requested to submit a more detailed proposal or invited to make a presentation to the Selection Team. The Principal Investigator will be required to submit a progress report at six monthly intervals during the course of the programme. At the end of the project a detailed review of the research, and its accomplishments, will be provided by the Principal Investigator. It is expected that the results will be published in peer-reviewed journals and the investigators are encouraged to present their preliminary findings in appropriate scientific meetings. Timing: It is anticipated that proposed projects will be of either 2 or 3 years duration. Cost: The support available for this programme of work is in the region of $150k per annum.